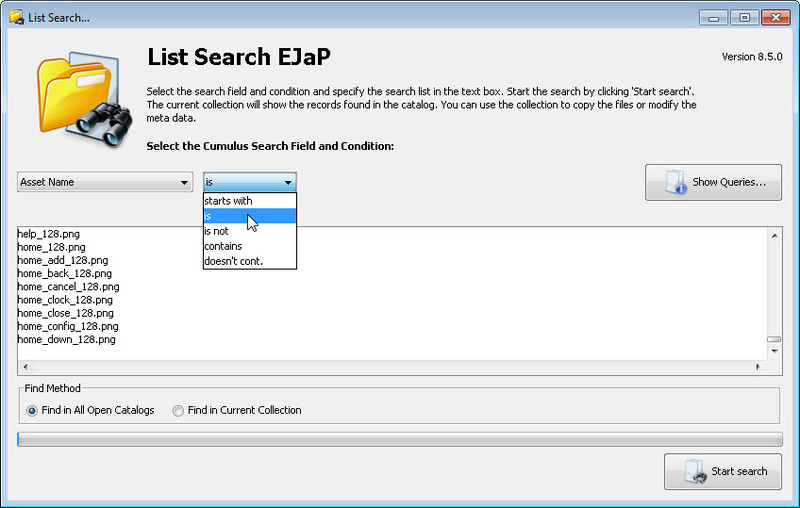 List Search allows you to search for records in the Cumulus catalogs specified in a text list. For example, this can be a list of filenames, product codes, article numbers, etc. Each list entry will be converted into a configurable search query. The search result of all these search queries will be displayed in the frontmost Cumulus Collection window. The search query that is generated for the selected list can be saved to a Cumulus Query file that can be loaded by the Cumulus rich client later on if necessary. The latest version implements a new search function: a search query can now be performed on all the records in all the open catalogs or it can be performed only on the current records (in the current collection). Contact us to learn more about List Search and request an evaluation copy.